Today was another long day of travel with many stops along the way. We woke up at 5:30am. I know that I can easily wake up at just about any time of the morning, but it definitely doesn’t get easier! We were on the road by about 6am. Since it was still dark when we left, everyone naturally went back to sleep on our drive. We stopped at the Haast Visitor Center to take some notes for our module. It was more of a bathroom stop than anything. 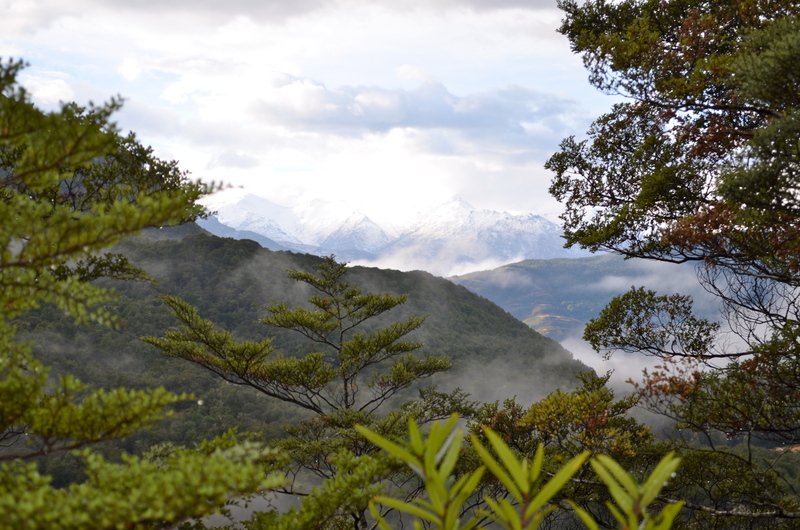 Our next stop was at the Haast Lookout. We were told it was a 20-25 minute all uphill hike that was pretty steep. I decided that I didn’t want to miss out on the lookout, and made it all the way to the top! It actually didn’t seem to take that long. About 5 minutes into our hike, we were walking on snow and ice. Everything was covered in white and it was fun. I could’ve stayed for a while and played in it! The outlook was of the Southern Alps. We actually were standing at the place where the Indio-Australian and Pacific tectonic plates met up. Pretty cool, huh? After that little hike, we got back on the bus and drove to a place for lunch. After driving a bit more, we went to Fork Farm just outside of Queenstown. It’s a sheep farm! We got to pet and feed Stella the sheep. We also got to meet the herding dogs and watch them in action. It was so intense how they directed the sheep. One of them even jumps on top of the sheep to get from one place to another. The sheep trip over each other to get where they’re going. I took a video of them coming into the barn place. We learned how they use the sheep as a commodity in New Zealand, and all the processes that they go through as farmers. The owner said that a day of shearing sheep was equivalent to running three marathons in a day. It’s that exhausting and these shearers are to be considered athletes for their stamina. They also mentioned how they buy rams that are resistant to infections so that they can breed that into their herd. It’s sustainable because they won’t need to be using as many medications and they are creating more healthy sheep. After the farm, we drove into the heart of Queenstown. I love this city already. It’s beautiful. There’s a lake in the center, mountains in the distance dusted in snow, and there’s life in the city. Perfection. I’m still debating my choice of adrenaline rush. It seems like most of the group is doing bungee jumping. That still scares me but maybe if everyone else does it, I’ll feel better… I’d definitely do skydiving or even the canyon swing. The swing is like a free fall (like bungee) and then a swing (like ziplining). We’re going ziplining on Sunday though. I’ll decide sometime on my 8 hour hike (tramp) tomorrow on the Routeburn. The Routeburn is a famous track (or trail) in New Zealand that’s known internationally by outdoor enthusiasts and hikers. I’m hoping the weather is as beautiful as it has been, but they told us to expect snow and ice on our walk. Time for bed, I’ve got an exciting week left on my trip!